The aim of Activity 3 is to develop models for the description and prediction of the long-term corrosion losses and maximum pit depths of cast iron (and also steel) pipes buried in soil. The approach currently being pursued is to develop a corrosion model based on corrosion fundamentals and on documented field observations. The models will describe the amount of corrosion as a function of exposure period and the main influencing external soil conditions. Field data has recently been collected at a number of condition assessment sites within Hunter Water Corporation’s network, and this data was used to calibrate an initial model for pipes buried in clay soils. 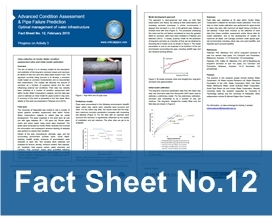 A summary of this work is presented in this fact sheet. More details on this work are presented in Petersen et al (2013).